In 2013, the Food and Drug Administration (FDA) proposed some of the most sweeping food safety rules in decades, in response to high-profile outbreaks of food-borne illness and death from salmonella. While many of these new rules build on existing voluntary industry guidelines and standards for food safety – which many companies already follow – it has also put the spotlight on the identification of risks and hazards that can occur on the production floor and the continuing need to comply with Good Manufacturing Practices (GMP). From surface finishes to fabrication materials, food grade platforms are generally constructed according to sanitary guidelines that make them “food grade.” As a general rule, they are to be fabricated and designed in such a way that they can be easily cleaned, inspected, and maintained. When designed properly, food grade mezzanines – used to support both equipment and workers – can reduce, and even eliminate, potential risks of product contamination. By using pre-built structures that simply bolt-in at job sites, platform installation is more efficient and cleaner, allowing production facilities to quickly pass rigid food safety audits and inspections. Adding a warehouse mezzanine is simpler than what you might think. 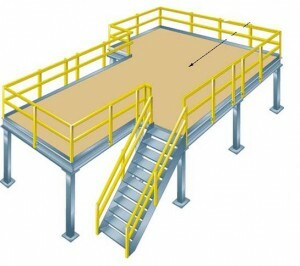 In fact, most industrial mezzanines use secure bolt-together connections, and can be dismantled and relocated. What’s more, they qualify for accelerated 7-year capital equipment depreciation, as opposed to the 39 years normally associated with permanent building improvements. Outsource Equipment Company is a distributor of the top manufacturers of material handling equipment, and our short list includes Cubic Designs Inc. Cubic Designs manufactures safe, strong, proven mezzanine systems designed to help you maximize your footprint and increase productivity – and they’ve manufactured more than 8,000 mezzanines over the past 25 years. Why Use Outsource Equipment To Meet Your Mezzanine Needs? We offer end-to-end support for your mezzanine installation project. Our experienced engineers will reduce your time to installation, improve the use of your available space, and seamlessly integrate your mezzanine into your system – all for the same cost as you would spend just on your mezzanine purchase price from other vendors. Outsource Equipment is your premier supplier of warehouse mezzanines and offers various warehouse mezzanine floors and set ups. Whether you need structural I-Beam or roll-formed truss mezzanines, rack-supported or free-standing mezzanines, we have the warehouse mezzanine for you. And if you need help figuring out what industrial mezzanine system or configuration is best for your operation, this form is a good start.